As parents of two girls, and my husband and I have wildly different approaches to getting them dressed each morning. My approach is to find a cute, color-coordinated, weather-appropriate outfit. His approach? Reach into their drawers, grab whatever garment his hand touches first and throw them on at the speed of light. So what if the results are navy paired with black, or a shirt worn backwards. They’re dressed, aren’t they? No doubt many parents can relate to the struggle of getting the kids dressed and out the door in the morning, which is why the wardrobe fail that’s been circulating the internet is so darn funny. Imgur user Laureeadeline shared her story after picking up her daughter from daycare and noticing that she was wearing overalls with no shirt underneath. 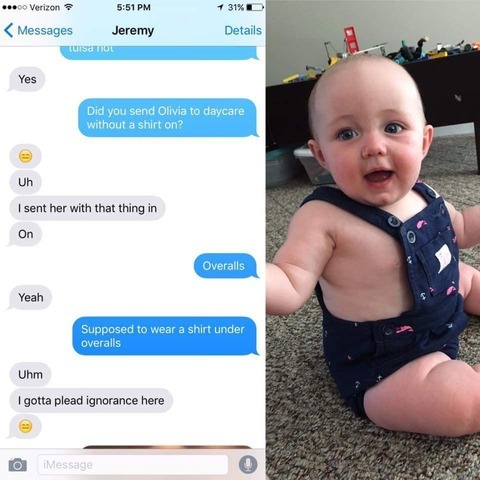 She assumed her baby’s shirt had suffered some sort of diaper fail at daycare until she exchanged texts with her husband. Only then did she learn that rather than a diaper fail, there had been a wardrobe fail, and her husband, Jeremy, had sent their sweet baby off to daycare that morning wearing nothing but overalls. “Did you send Olivia to daycare without a shirt on?” she writes. “Uh, I sent her with that thing on,” Jeremy responds. Read the full exchange for yourself and see if you don’t laugh out loud.